Ballinacurra - the last home of the topsail schooners in Cork. The town of Ballinacurra is set in the north east corner of Cork Harbour on the Owenacurra river. It is almost nine nautical miles from Roches Point at the entrance of Cork Harbour and is navigable by vessels drawing up to 3m at high water. It was for very many years a very important commercial port with fine limestone quays and warehouses and stores on the quayside. 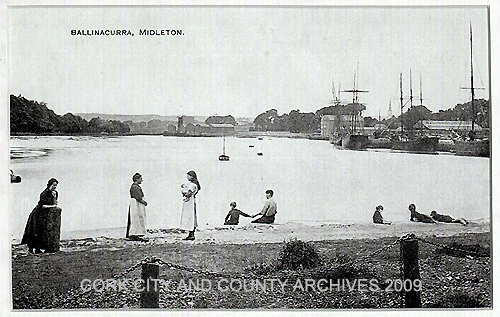 The village grew up around the where the Owenacurra River meets the east channel of Cork Harbour. It served as the port for the town of Midleton, which is less than 2 km north of Ballinacurra, for centuries and became a loading and unloading point for coal, timber, iron and slate and later flax for the linen industry.Ballinacurra was a major barley malting location from the late 18th century, using the fine local barley of the East Cork area. Ships took the finished malt mainly to Dublin where it was used in the brewing industry. In the old days sailing ships of up to 300 tons used the port. The last sailing ship based in Cork Harbour sailed from there- she was the schooner "Brooklands" owned by the Creenan family. When exports finished from Ballinacurra the quays were used for breaking up coastal ships - including a number of ships that used to ply the waters of Cork Harbour. The port of Ballinacurra closed in 1962 as it was deemed too expensive to dredge the growing levels of silt and mud at the entrance the small harbour. It is now used almost exclusively for small leisure boats. On Saturday 24 September Cove Sailing Club will run a dinghy race from Cobh to Ballinacurra - nearly 7 miles. This is the "Ballinacurra Cup" which was presented by the Irish Naval Service to Cove Sailing Club in 1947. 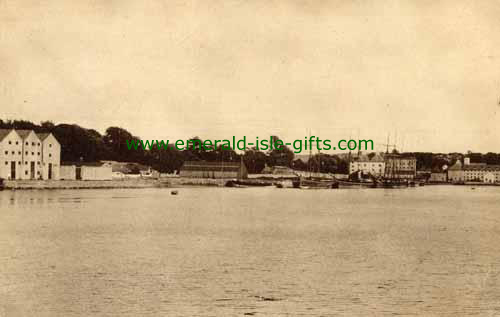 It is be competed for by dinghies racing from Cobh to the eastern end of the harbour and then up the Owenacurra River to Ballinacurra village. It is a very scenic trip with the upper reaches of Cork Harbour looking their prettiest at this time of year. SailCork will be competing aboard the Raider 18 "Yomkon" with a crew of adults and the junior sailors will compete on "Kanko" and our "Vision". All the crews moor up at the historic quays and make their way to "Jacko's" "Brooklands Bar" - called after the last schooner to trade out of Cork Harbour. There is always a great party ashore where everybody is made feel very welcome by our host Nina. This year there will also be a cruiser race organised by Monkstown Bay Sailing Club and the National 18 fleet from the RCYC will finish one of the races in their National Championships at Ballinacurra - it will be high water at 15:40 so boats should arrive from 13:00 onwards and will have departed by 16:00. The Ballinacurra Cup is one of the oldest "all in" dinghy handicap trophies. There is also a race to Ballinacurra in the late spring and there is no better place to retire to on a high water in a winters day when it is cold afloat! SailCork visit Ballinacurra on a regular basis with their junior sailors on a day trip and with adult kayakers. You too can find out how to safely navigate tidal waters as the SailCork series of navigation courses begins in a few locations in Cork at the end of October.